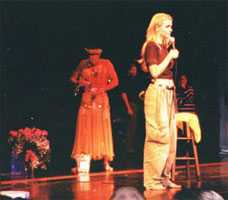  When I attended Creation Entertainment's 2001 Dearborn Xena Convention, its ultimate significance never crossed my mind. Meeting Kevin was the reason I drove 150 miles to Dearborn, and I am happy to say Mr. Smith did not disappoint. Xenites need no one to tell them that Kevin Smith was a talented actor with an amazing singing voice. We hear all the time what a good sport he was, a kind fun-loving soul. However, when I attended the convention, I got a rare and precious glimpse at Kevin Smith the person. I do not know what I expected. Ares with a Kiwi accent? If I did, this thought quickly was blasted out of my head. I do not think a person could be more unlike Ares. It just goes to show what a good actor Kevin Smith was. The second thing I noticed was that he seemed smaller in person. Although I have heard this or that about comparisons between real life and the small or big screen, Kevin told us he had just lost thirty pounds for another role. I was not imagining it. Unlike Lucy Lawless' Kiwi accent, Kevin Smith's is very thick. Nonetheless, I understood about 90% of what he said, and even that was laced with a few colorful Kiwi euphemisms. Boxers ... and a tiara? The highlight of Kevin's appearance on stage, though, was when he took off his clothes. If anyone wonders if Kevin Smith wore boxers or briefs, the answer is boxers. When Kevin dropped his pants, my sister and I (as well as many others in the audience) were actually screaming. Of course, the removal of clothes was for charity. With Hudson Leick as ringleader and instigator, no one can say she does not know how to put on a show, especially when someone else is disrobing. This was all in preparation for the big switcharoo. Hudson and Kevin disappeared for a few minutes, then reappeared wearing each other's clothes: Kevin modeling Hudson's bright orange belly dancer's costume, little tiara and all. It was a sublime, inspired moment. Feel the love ... and those biceps! Then someone had the bright idea to give more money to charity by shoving twenty-dollar bills into Kevin's brassier and skirt. Eventually, with a line encircling the stage, Kevin endured small talk, hugs, and kisses. He posed for pictures in his orange dress full of money--all with good humor and aplomb. At one point, he had to dump the twenties from his bra into a bucket someone had set on stage. I heard him say he needed "milking." In half an hour, Kevin and Hudson raised $2,000 for charity. Moreover, that was before they auctioned the dress. Later, when I finally shook Kevin's hand in the autograph line, I thanked him for coming, and he said, "Aye, I'm zoomin' too, mate." Because of his thick accent, it took me a minute to figure out what he said. Can someone have down-to earth class? If so, Kevin Smith exuded a sense of not taking himself too seriously though at the same time enjoying all the attention. The convention was not an ego trip for him. I got the sense that he was celebrating too--with us. When my sister left the autograph table, she was actually shaking. She said she was "all aflutter," and I could relate. It is not often we meet someone who is as talented, gorgeous, and friendly as Kevin Smith. That evening at Kevin's and Hudson's performance of A.R. Gurney's play Love Letters, Kevin's Kiwi accent transformed into an American accent. I got my first glimpse of Ares that Saturday, though this glimpse (as well as every subsequent viewing of my favorite Xena episodes) was touched with the person behind the character, adding a depth and humor I will continually enjoy. The play, which was so great that we gave them a standing ovation, was Kevin's penultimate convention appearance (Smith's last convention appearance was October 20, 2002 in Phoeniz, Arizona). Grieving for someone I do not really know has its problems. On one hand, my every day life is not affected. There is no hole in my life where a person used to be. Although I have much esteem for him, I could never say Kevin Smith and I were friends. Still, the world is a different place without him. I will go about my day, remember, and break into tears all over again. I grieve for his lost potential, all the good things he was going to do, and I grieve for his wife's and sons' loss. Kevin Smith made the world a better place just by his presence. Although I am grateful for Xena: Warrior Princess for many reasons, one of them is bringing someone wonderful to my attention, someone I would never have known if it were not for the show. "Aye, I'm zoomin' too, mate." I am a writer from Western Michigan. Although my Xena doll stands proudly in my goddess shrine (along with Kali, the Virgin Mary, Black Madonna, Green Tara, Wonder Woman, Galadriel, and Farscape's Zhaan, etc. ), my Ares doll can only stand back and watch--though he likes that.